I got my 1988 Sunny this winter and the only thing I have left to test is the Hot Water Heater. It is currently bypassed, so I am not optimistic that it works, even though I was told it does. It was bypassed by removing the input and output hoses and threading them together with a piece of threaded pipe. My question is should I just reconnect them to the tank or is it worth it for me to create a bypass system with valves etc. It doesn't seem like I would really ever want to bypass it but I see that newer h20 heaters come that way on newer models, but I'm not sure why exactly. Perhaps for winterizing purposes? I would put bypass values in. Living in Minnesota it will come in handy when winterizing the trailer. 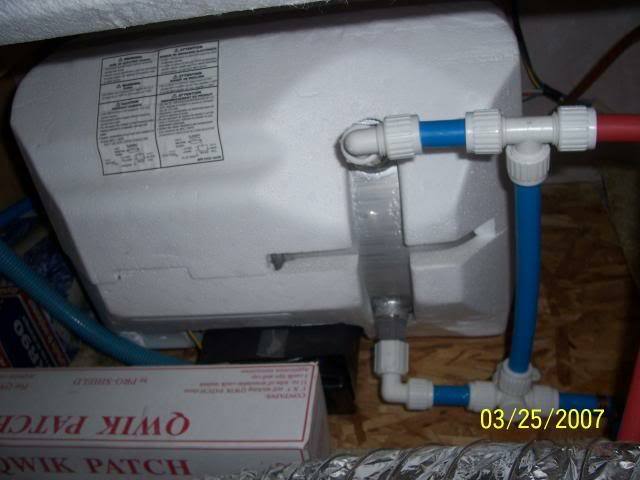 When you winterize the trailer next year, blow the water lines out, without the hot water tank bypassed. This will get all the water out of the HW tank. Then bypass the HW tank and add antifreeze. This way you’re not filling up your HW tank with antifreeze. Plus if your HW Tank has an anode rod, antifreeze will prematurely corrode the anode rod. Thanks Hutch. That will be easy enough to do. Do I need to have check valves or anything other than 4 valves in a bypass configuration? Now I just found this picture in another post. I was under the impression that I will need 2 bypass setups. The pictured tank only has one, which seems simpler. My HWH is set up differently with a Tee at each both tank connection. I guess I need to look closer at where these lines go. I can post a picture of mine, tonight, if needed. Also, my tank doesn't have any insulation. Can this be purchased or should I just make my own little HWH blanket? The picture you posted is a perfect model to follow. The older Sunlines had 2 valves, one at the top and one at the bottom of the bypass pipe. The picture looks like it’s from a newer Sunline model that has only 1 bypass valve. I’m not sure on how specifically the single bypass valve works. If I were doing what you’re planning on doing, I would go the simple way with 2 bypass valves. Then set each valve so they direct water through the bypass pipe for winterizing or set each to direct water flow into / out of the HW Tank for camping. The picture you posted is a perfect model to follow. The older Sunlines had 2 valves, one at the top and one at the bottom of the bypass pipe. The picture looks like it’s from a newer Sunline model that has only 1 bypass valve. I’m not sure on how specifically the single bypass valve works. With the single valve setup, a check valve (backflow preventer, one-way valve - lots of names) is installed on the HOT side of the heater. This allows liquid to only flow OUT of that connection, thereby stopping antifreeze from making it's way into the heater. If you are buying parts, I would buy qty 2, 3 ways bypass valves. Yes Mine has the check as was described in the top line but it also leaks antifreeze into the HW heater until it would set the check. About 1 quart leaks in. The check works and is cheaper, but for the money I would by the 2 valves. ...my HWH started leaking from the tank. That was the last appliance to test since buying the camper in late winter - everything else worked. I found an exact new replacement on eBay for $200 shipped. Local dealer wanted $350! I also had a bad valve in the toilet, but I guess these things are to be expected in a 20 year old camper! The valve was a fairly easy $25 fix. I was surprised to find a part for a 20 year old toilet! At least I know what I have now and can maintain things to last.